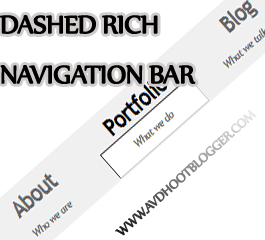 Dashed Rich Navigation Menu Bar Widget For Blogger, Coded in HTML and CSS with three colors white black and gray. Rich and Stylish Look. Dashed rich navigation menu bar widget for blogger is good for those websites and blog who have light color of their template. As this nav bar is built with light colors so it will look fine in dating and entertainment websites and blog which mostly prefer light colors for their web design in the similar way we also have yellow navigation menu Bar and Pink navigation Menu Bar. We also have some dark color navigation menu like Blue Navigation Menu For both Blogger and Wordpress. Image accordion Widget For Blogger For custom Recent Post. Add Post Title Before the Homepage Title. This blogger widget works in all browsers like Firefox, Opera, Google Chrome and Internet Explorer. It is fast in loading. Pure CSS Based Navigation Menu Widget For Blogger. I Hope you liked Dashed Rich Navigation Menu Bar Widget For Blogger and Wordpress. Feel free to comment and share. Description : Dashed Rich Navigation Menu Bar Widget For Blogger, Coded in HTML and CSS with three colors white black and gray. Rich and Stylish Look.